Looking for the perfect Easter Brunch item to serve this weekend? These Savory Breakfast Waffles composed of cheddar cheese waffles, crispy fried eggs, savory bacon, and a maple infused cream sauce are just what the Easter Bunny ordered! I’m partnering up once again with Hood® Cream to show you how easy it is to create a decadent brunch item for friends and family. Easter Sunday is just a few days away and if you’re hosting an Easter Brunch, this recipe is for you! 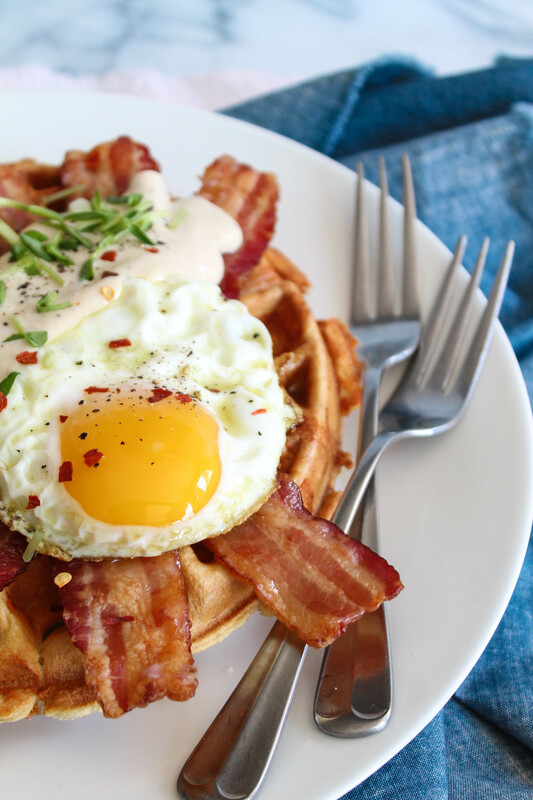 Imagine crispy, cheddar waffles that are topped with a fried egg, savory bacon, and drizzled with a luscious maple-infused cream sauce – seriously, it will become a family favorite for years to come. It’s simple to make but impressive once served. Brunch is hands down one of my favorite meals, if not my favorite. Having brunch means you’ve slept in a bit and slowly arose from your warm bed. There’s no rush to get to brunch, since it’s typically served well into the afternoon. Brunch just patiently waits until you’ve had your first cup of coffee at home and once you’re ready, it’ll refill your coffee cup or serve up a bubbly mimosa. Brunch is sort of like love: brunch is patient, brunch is kind – don’t you agree? Like I mentioned above, for today’s Savory Breakfast Waffle recipe, I’ve partnered up with Hood® Cream once again because it makes sense to combine brunch with a brand that’s been at the breakfast and brunch tables of hundreds of thousands of New Englanders and the rest of the US. For more than 170 years, the name Hood has been synonymous with fresh, quality dairy products that taste great. I’ve not only been using them at home for the past ten years, but it’s the only dairy brand we use at the restaurant! Bacon is baked in the oven for 12-20 minutes, depending on thickness. Waffle batter is made while bacon bakes and waffle iron warms up. Maple-infused sauce comes together and is whisked in under 5 minutes. Eggs are fried just before serving! For this recipe, I used Hood® Light Cream both in the waffle batter and the maple-infused cream sauce. This light cream is a favorite to have in the refrigerator because a quick splash into any of the dishes I am creating helps it develop into a lovely sauce – perfect for pasta dishes, which we consumed plenty of this winter. In the waffle batter, it brings great flavor and in the sauce, it just makes it the richest, creamiest sauce ever! A win win for everyone. 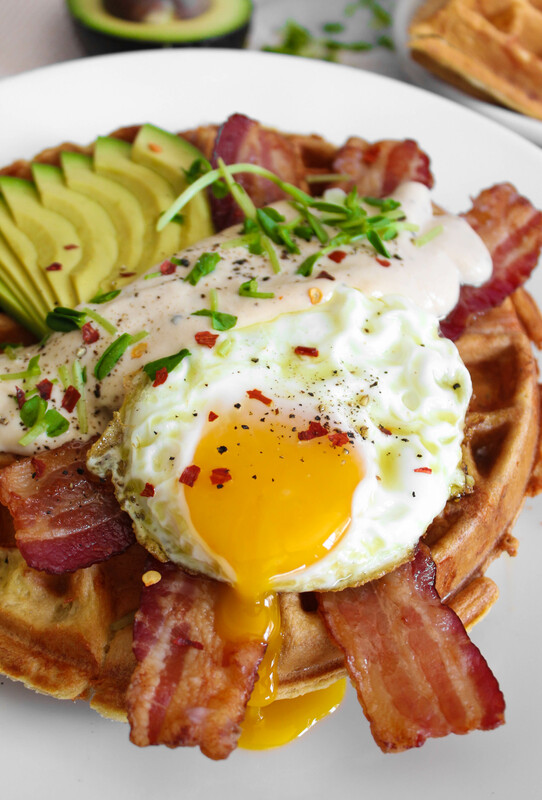 These Savory Breakfast Waffles are all about the herb cheesy waffles, eggs, bacon, and the maple infused cream sauce. The perfect special occasion breakfast or brunch! Preheat the oven to 350F and place bacon on a tray. Bake for 12-15 minutes, depending on thickness of bacon. While bacon cooks, mix all of the waffle ingredients together until well incorporated. Preheat the waffle iron. In a small sauce pan, simmer the light cream and seasonings. Once slowly simmering, add the water and cornstarch mixture, whisking quickly. Reduce heat to low and keep warm for serving. To serve, make waffles per usual. 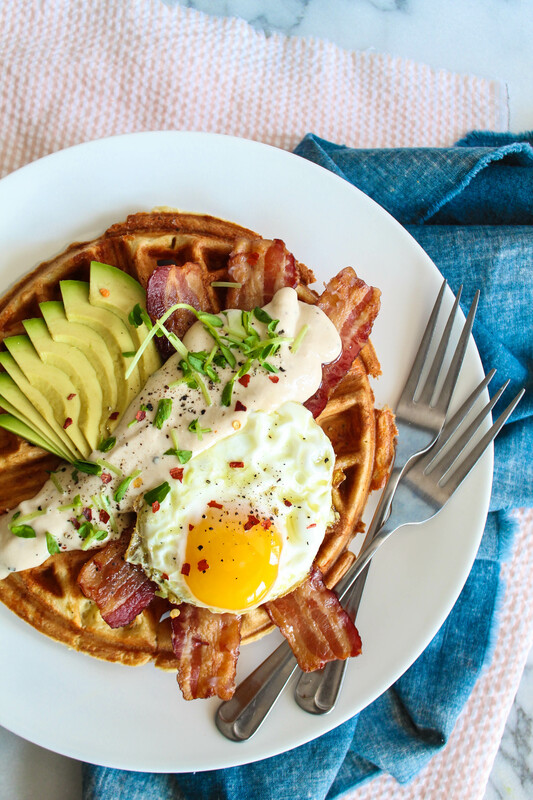 Fry eggs and top waffles with fried egg, cooked bacon, sliced avocado, and drizzle maple cream sauce over everything. Add an extra touch of black pepper or micro greens for color and flavor, and some red pepper chili flakes for heat (optional). To find more Easter-inspired recipes, head over to the Hood Cream website. Remember you can find all Hood products across New England grocery stores – and if you don’t see it at your local store, ask them to carry it for you!